The elusive scent of this bar comes from essential oil of pink grapefruit and makes your shower a refreshing, exhilarating experience. 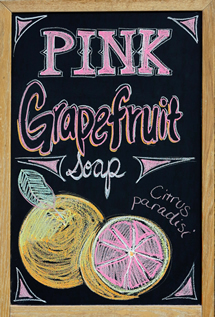 Grapefruit is said to be a skin toner and helpful for oily skin. Rosehip powder provides gentle exfoliation and natural color. Australian pink clay adds color and creaminess to the lather. Avocado oil superfats the bar to moisturize skin. 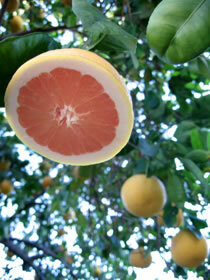 A good customer from Arizona sent us his enchanting photo of the grapefruit tree in his backyard. Love grapefruit? Try our Bath Bombs! Here are easy, fun ways to prepare juicy, delicious and nutritious grapefruit.